The chain link knot is, in general, only practical for use in macramé chains. It is not like the basic knots, which can be utilized in functional applications. The chain link has no purpose except as decoration. It is so named because, once tied, it looks very similar to the chain links in a swing set. It is a modification of a half hitch knot, and accordingly is not that complex to tie. 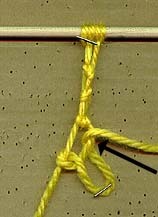 The first step is to set up for a standard half hitch, yet in contrast, the half hitch is not pulled snug but left loose. Place the loop in the approximate position that the finished knot will occupy. With the same decorator line as the half hitch, bring it under, around and through the formed loop. With the hand holding the anchor line, place the line between your ring and pinkie fingers and hold snugly. Next grasp the original half hitch loop (A) with your thumb and first finger of the same hand and hold snugly. The decorator line can now be pulled with your free hand to form the knot. Pull snug but not tight. It is generally best to alternate the knots from right handed to left handed, building a secure chain. Magazine Description American Patchwork & Quilting is written for the craft enthusiast. Each issue includes project ideas, quilting contests, tools and new products for quilting and patchwork, stitching tips and techniques, pattern sheets, and step-by-step instructions for creating beautiful quilts and accessories.